Welcome to my porch. It's been beautiful weather here, if you don't count an earthquake. I'm almost embarrassed to say that I thought my washer had an unbalanced load when I first heard the rumbles and shaking of this old farmhouse. Seconds later, I realized what was happening. A few things fell off shelves, but only an empty canning jar was broken. I was a bit frantic because I couldn't find my youngest, but I quickly remembered that she was at the barn with C.S.Farmer. It was really strange to have the same feeling you have when you get off a boat. I was only trying to walk in my house and I noticed it was a challenge for a few minutes. Perhaps an earthquake throws off your equilibrium. 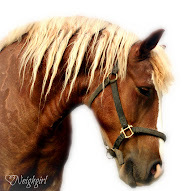 Molly, D3's horse, was swaying in the field. The house cats were scared and the farm cats were noticeably absent for a while. All this leads me to think of how terrible things must be for the people in Japan. This was a much smaller earthquake. 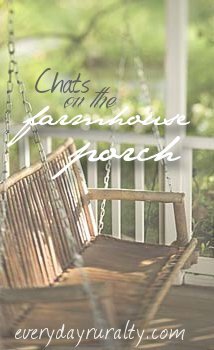 Please feel free to answer the questions in comments or make a post about "Chats on the Farmhouse Porch". I hope more folks will join in so we can meet new friends. I know #5 is a bit different, but I was looking at a lone star the other night and I remembered the little poem from childhood. 1. That's a tie between cream of mushroom soup and French onion soup. I also love beef vegetable soup. 2. I love to see both, but plays rank a bit higher. The convenience of watching a movie on DVD at home does have merit though. 3. My most unusual birthday celebration was a few years ago when a German lady came to the farm for a farm tour. She brought her guitar and sang to the girls and me. She brought us gifts (from a yard sale- with price stickers still on). She had me play a tape with music and insisted on teaching us the chicken dance. Don't ask. The girls talked me into dancing. She left and was never heard from again. Several years later and I'm still scratching my head, saying, "What the ---- was that all about?" It just happened to be on my birthday. TOP THAT! 4. I'm the youngest, but by so much, that I was raised almost like an only child. Let's just say "youngest". I read an interesting book on birth order once by Dr. Kevin Lehman. It was a good read and I found much of it to be so accurate. 5. I wish for good health for all my family and friends. If you don't have good health, so many of the things one could wish for wouldn't seem as important. I look forward to seeing your answers. Have a good rest of the week! 1. What's your favorite kind of soup? I love a good ole fashion homemade chicken noodle! 2. Do you prefer a movie or a play? Depends on my mood. For the most part, I would say movie. 3. What was your most unusual birthday celebration? (It can be the most unusual celebration you attended, if you wish.) I'm not sure. How's that for an answer? 4. What position were you in your family- oldest, middle, youngest, only? I am the middle girl, but rank number 4 among 5. 5. Please finish this: Star shine. Star bright. First star I see tonight. I wish I may, I wish I might have this wish I wish tonight…I wish my brain would shut off so I could think about going to sleep! 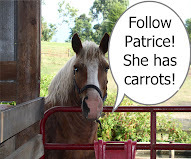 Thanks, Ms. Patrice, for letting me join in again this week. HOPE you have a great rest of the week...and weekend!!! P.S...we didn't feel the earthquake here in our neck of the woods! 1. too hot to even think about soup. 3. hmmm. don't know about that one. I promised to feature a guest post today so I'll post my porch chat answers later today! See you then! 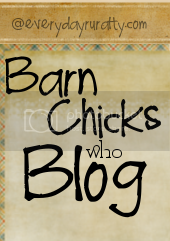 Joining you yet again for another Wednesday of blog hop fun. Thanks for hosting. I linked my post responding to these questions. I hope y'all will come by and visit! =D PS: Glad to hear everything turned okay for you yesterday. That was scary, I know. Hey there, I always think earthquakes do mess with your equilibrium. They always make me feel dizzy. I think the weirdest thing is to see how the walls move inward and outward like they were made of paper. I will be doing my post after I get the first wave off to school. That birthday you wrote about was just weird. I bet you still scratch your head. 1. my favorite soup is home made Beef Vegetable and Barley. 2. 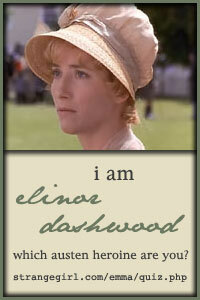 I love both movie as and plays as long as they are interesting. 3. My next door neighbor made me carry a birthday cake to another neighbor's house and sid not to let her daughter see it as it was a surprise. When I delivered the cake, there was a party going on and everyone jumped up and yelled SURPRISE JULIA and they all had a good laugh that I was fooled. I was surprised all right. 4. I'm the 3rd oldest from a family of 17 kids. yep... you read that right. 5. I wish for PEACE, LOVE and HARMONEY in the world.